ELITE CLUBMAKER AWARD FOR 2003. Where Craftsmanship and the Latest Technology Join Forces. Highest Quality Golf Clubs at Fair Prices. Most custom clubs are shipped within 2 days. See our guarantee, shipping, and ordering information. The greatest compliment our customers can give are their repeat orders and referrals of their family and friends. THANK YOU for the hundreds of repeat orders and referrals!! Over 66% of our golf club business comes from these types of orders. SHIPPING COSTS WILL BE REMOVED WHEN ORDERS ARE FILLED. Another Great Hitting Driver-the New Integra SoooLONG 175, patented. Total driver weight is only 260 gram, 60+ grams lighter than most drivers. You owe it to your game to try this driver. At only $99 complete with a quality 45 gram filament wound, spin-aligned graphite shaft, WinnLite grip, and Integra head cover, it's a bargain! I play this driver and get 20-30 extra yards! OUR BEST SELLING CLUBS are the SINGLE LENGTH IRONS. SALE ON MOST ASSEMBLED CLUBS. NEW CLUB CLOSEOUTS AND DEMOS . PUTTERS ARE ALSO DISCOUNTED AT LEAST 20%. Any Tour Edge clubs may be ordered. There is No Limit to Distance. CHECK OUT THE new ultra light driver: INTEGRA SoooLong 175. Explosive distance and legal! Great hitting ironwoods--individual to full sets. Tom Wishon Golf Technology--BEST IN THE INDUSTRY! 1. ALIGNMENT MALLET PUTTERS with Center Line and Balanced head. 2. EX⁵TREME, FACE FORWARD WEDGES, easier from every lie with NO Shanks. 3. UTILITY/RESCUE-TYPE CLUBS easier to hit than your #3,4, or 5 irons. 4. SINGLE - LENGTH IRONS--one swing plane, one lie angle, one head weight. They have huge sweet spots and better accuracy. Great replacement irons for your regular set of hard-to-hit irons. See if hybrid irons are better for your game. Also, read about the different types of Hybrid Clubs in Hybrid Information. Featuring high quality clubs from Silver Diamond, Integra, and Custom Built. BEST SELLER FOR OVER 11 YEARS!! The original Tight Lie Wood, the SUPER CONCORDE, is the MOST POPULAR & EASIEST-TO-HIT FAIRWAY WOOD in the world for the past 9 years, priced from only $35 (originally $79). SALE PRICED at only $24. Perfect offset for chipping from any turf. SALE PRICED at only $34. Inazone Hefty, SV-4017, Acer, Inazone B putter, Wishon Smooth 6 or 7, and many more. Choose from many lengths and many grips. Most std. lengths priced under $40. Many Long Putters priced under $60. HAVING TROUBLE HITTING YOUR IRONS?? ARE THE IRON-WOODS BEST FOR MY GAME? CLICK HERE FOR SOME GUIDELINES. INTEGRA X9 EXTREME MOI IRONWOODS-- RH & LH, SETS of 5 FROM ONLY $165 New for 2014. 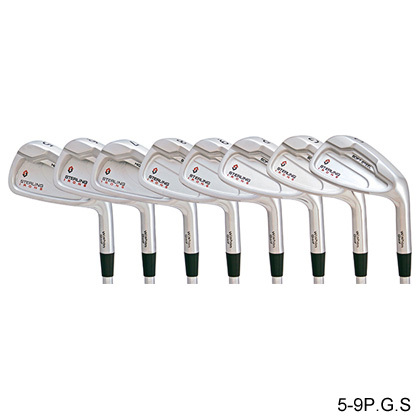 SILVER DIAMOND RM-5 HYBRID IRONWOODS -- SETS of 5 FROM ONLY $165. Most Priced at Cost--Prices Good on Existing Stock Only. New clubs priced below our cost. Many are one-of-kind.